Utoro is a fishing port facing the Sea of Okhotsk, and is the greatest sight-seeing base in Shiretoko. Yuhidai is heights which overlook the town of Utoro. Utoro hot spring was developed in Yuhidai in 1972. Here is large-sized sight-seeing hotels. Yuhidai-no-yu is near the national Shiretoko camp place which is a public camp site. This is a public hot spring used for the traveler. 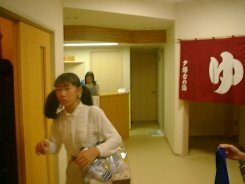 Coin-operated laundries are also established in Yuhidai- no-yu, and it is very convenient for campers. Since it was night, a photograph of the building has not been taken. Since we visited at the most crowded season, it was very crowded. The number ticket of bathing order is distributed to the people who are waiting. After we wait at a rest room, we are called for an employee. There are open-air baths and indoor baths. Water of the open-air bath is thin blackish brown, and is a salty taste. Since it was heights there, we expected the good scene. Since there is wood, the sea is not visible from the open-air bath with regrettable. The inner bath has a shampoo etc. It is equipment very wonderful as a hot spring in camping space. Ice and syrup are also sold at the rest room. It is open from June to October. Progress the national highway of No. 244 toward an east from Abashiri, and go on the national highway of No. 334 to Utoro from the Shari-cho. Turn to the right in the place which passed the sight-seeing information office of Utoro, and go up a hill. Yuhidai-no-yu is near the Shiretoko prince hotel. A large parking lot is in front of the hotel. 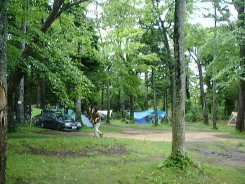 Shiretoko national camp place is a public camp place of Utoro. There are a general tent site and an auto-camping site. Since it is the camping space in woods, the high season is also quiet. The ground is grass. There are a cookhouse and a toilet. A receptionist is from 9:00 to 19:30. Since it is close to a town, shopping is easy. The dinner of tonight is spaghetti. We bought food in the supermarket in Shari. It is very delicious when the same thing is also eaten outside.